Helmet and acoustics research might offer riders a quieter trip. (Inside Science) -- Before hopping on his motorcycle, Michael Carley puts on earplugs, followed by his helmet. It's a step many riders take. After accelerating, most of the sound that a rider can hear isn't from the bike engine or other vehicles on the road, but from the air rushing over and around his helmet. The helmet Carley wears is designed and tested for comfort and impact protection -- but not for sound protection. Noise inside the helmet can reach rock-concert levels when traveling at highway speeds. Carley, a mechanical engineer, has gathered a group of engineers and psychologists to study how to minimize helmet noise. The group includes researchers from two U.K. universities, the University of Bath, where Carley works, and nearby Bath Spa University. They are studying how to protect riders from hearing damage and reduce the potential distraction that noise poses to riders. "Riding a motorcycle is a very noisy endeavor," said Rick Korchak, editor of webBikeWorld, a popular motorcycle website that carries detailed helmet reviews. "There are no quiet motorcycles and there are no quiet helmets." While riders and others recognize that noise can be a problem, many U.S. jurisdictions prohibit the use of earplugs or other noise-reducing devices. 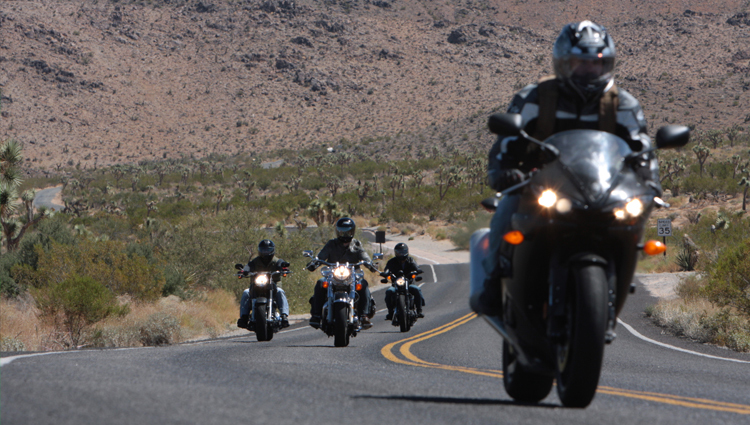 One long road trip could take a rider through numerous changes in local laws. "A lot of people, they just do what they're comfortable with, irrespective of what the jurisdiction says is the law," said Charles Brown, a psychologist specializing in sound perception from the University of South Alabama in Mobile. "We strongly advocate the use of high-quality, correctly inserted earplugs when riding a motorcycle," said Korchak. He added that good earplugs will not eliminate all noises, allowing sirens and traffic to be heard. Riders experience noise from multiple sources. First is the engine noise, which is a relatively insignificant factor once riders accelerate to highway speeds. Audible wind noise can reach volumes as high as 115 decibels or more, roughly equivalent to what power saw operators without ear protection would hear. The Occupational Safety and Health Administration recommends limiting such exposure to 15 minutes or less per day. Most initial academic research in motorcycle sound focused on long term hearing damage. The group from Bath began researching the topic by establishing reliable measurements of what happens to air passing over a helmet in a wind tunnel. Then, on roads and test tracks, they studied the relative placement of the rider and the motorcycle. They studied how all the important variables interact, such as the height of the windshield, the location of the helmet and the size of the rider. Turbulent air buffeting off the motorcycle windshield is one problem. The researchers found that small differences in air flow patterns can cause large variations in sound level. Subsequently, the Bath group took their experiments to wind tunnels to measure in detail what riders experience. The Bath group's most recent paper, accepted for publication by The Journal of the Acoustical Society of America, details the way airflow around the helmet creates noise. They found that for the type of helmets with a full shield and visor covering the face, the largest component of noise comes from air rushing around the chin bar, which wraps around the jaw. There's another type of sound experienced by riders, but it's more difficult to quantify, and not affected by earplugs. It's called body conducted sound. Aboard a motorcycle, this process transmits engine vibrations and the percussive force of the wind through the flesh and bone to the ear. Earplugs don't stop it, and it can be significant. "It's why your voice sounds different when you hear a recording of your voice versus what you experience as your own voice," said Carley. Reducing the amount of sound that reaches riders can benefit more than motorcyclists' hearing. Riders have to process the sound of riding, the sound conducted through their bones, and a wide variety of visual stimuli as well, all while responding to the situation around them. Another topic under investigation by the Bath group is how sound impacts attention. Nigel Holt, a member of that team and a psychologist at Bath Spa University, said that one experiment measured how different volumes of sound impaired a test subject's peripheral vision. Cutting down the amount of sound reaching riders is a complicated task. "Bone and body transmitted sound bypasses the ear canal entirely," said Holt. The Bath group found that lower frequency sounds, including body conducted sound, travel efficiently through the body. The researchers found that a helmet's structure may actually amplify that noise. Helmet designers are primarily focusing on designs that will best protect the head against impact, said John Kennedy, an engineer at the University of Bath. "I suppose the acoustic performance of the linings and the various materials doesn't necessarily enter into the design process." The shape of helmets could be changed to become more aerodynamic and therefore quieter, but a sleek, sweeping wedge like a racing bicycling helmet might fail to match the current shapes for impact protection and also make it more difficult to hold the head steady when peering over the shoulder before changing lanes. Both the Bath group and Brown believe consistent sound rating standards for helmets are needed and that other systems should be developed to reduce the amount of noise that reaches riders. That might require new research on materials that both protect against impact and limit the transmission of acoustic signals. Brown, working with Michael Gordon, a psychologist at William Patterson University in Wayne, N.J., performed an experiment to see how much noise canceling technology could diminish noise on a motorcycle. These devices produce frequencies that interfere with incoming noise so that the wearer is protected from potentially damaging sound levels. They attached a large set of noise-canceling earmuffs to a motorcycle helmet and placed the assembly atop an acoustically engineered dummy head. Their helmet covered the top and back of the head, but did not have a face shield. After driving the rig around at different speeds, they found that the device reduced sound by as much as 26 decibels, roughly equivalent to the difference in sound between a normal conversation and a busy roadway. Even without earplugs or noise-canceling, riders can make many minor adjustments to substantially reduce the amount of sound to which they are exposed. Kennedy said that small movements in riding position can change the volume of sound by more than 10 decibels, and that wearing a scarf around the neck can seal off the cavity around aerodynamically-tricky chin bar. "The most important thing that motorcycle owners can do is to make sure their helmet fits their head shape," said Korchak. Korchak said that there are five general helmet shapes. Getting the right size and right shape is important, so that the helmet fits snugly around the head and neck, along with jacket collars and the part of the helmet that fits around the neck. Carley said that it’s important that helmets be well-ventilated, so that riders travel with the visor closed. Riding with an open visor can create additional wind noise. He also believes that a change in motorcycle design could help, such as building windshields that allow air to flow through them. This would change the aerodynamics so that less air is pushed over the windshield and thrown onto the helmet, he said. Using active noise reduction is one potential method to protect riders, but it hasn't been successfully integrated into a production helmet. Brown and Gordon's next experiment investigates a smaller set of headphones that can fit inside a helmet. "We think that smart helmets that reduce the wind noise and are designed to transfer a reasonable amount of environmental noise is the way to go," said Brown. "We think that's potentially in the grasp of the technology today." The Bath researchers are currently focusing on passive noise reduction techniques such as acoustically absorbent materials. They are concerned about how the necessary protective materials and sufficient noise-canceling equipment can both fit in an effective helmet, as well as the lack of protection offered against body conducted sound.